A treat for all keen holiday cooks. We have equipped the kitchen with a full array of pots, pans and utensils. 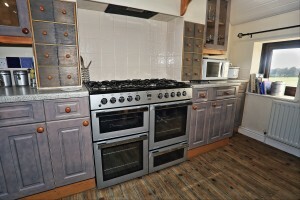 This is topped off by a top quality range cooker letting you get stuck into meals like being at home. Alternatively, check out our guide to eating out. The kitchen is also equipped with table and chairs for 4 adults. Edd Gollan Geayee features two comfy leather sofas to lie back and relax on. You can choose to take in the view up the lane through the tall end window or take in some more hi-tec entertainment on the 42″ flatscreen television. 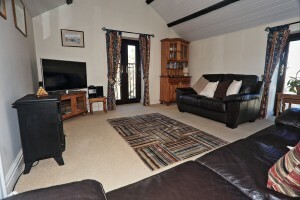 The living area is fully connected with DVD, Freeview and free to use Wifi connection. The living room is on the 1st floor of the barn, which is reached by a feature spiral staircase. Downstairs, we have the Master bedroom, twin bedroom, bathroom and utility. The master bedroom contains a king size bed, and pine furniture which includes individual bedside units with reading lamps and a clock radio. Both bedrooms are located on the ground floor. A built in wardrobe and additional drawer unit with mirror, allow for plentiful clothes storage. 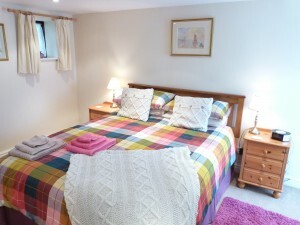 Duvets are used on all beds and additional blankets and pillows are available. 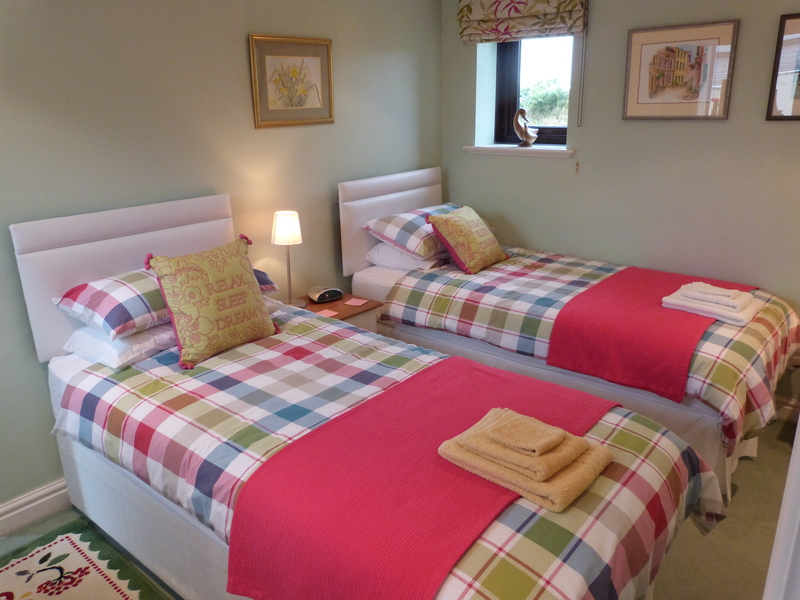 The second bedroom contains 2 zipped and linked 3 foot beds which can make either 2 singles or a 6 foot bed. Bedside cabinets are provided with reading lights and clock radio. A built in wardrobe and an additional chest of drawers with mirror give plenty of clothes storage. Both bedrooms are fully carpeted and are fitted with radiators. Hairdryers are supplied in each room. Edd Gollan Geayee is also fitted with a fully equipped bathroom, with a bath and shower. If your adventures get you a little mucky, you will also find a utility room with washer, dryer and iron leading out onto a rear patio with washing line. There is also a purpose built barbecue grate, perfect for disposable barbecues. All bedding, hand, bath and kitchen towels will be provided and changed weekly. We ask that guests please provide their own beach towels. A few basic provisions will be supplied on your arrival to get you started and we would be pleased to help with any other shopping – please let us know. A cot is available if required, together with a safety gate for the stairs. Bookings are normally Saturday-to-Saturday. Pets are not accepted and we ask you please not to smoke in the barn for the comfort of subsequent guests. Browse the tabs above to explore just some of what Edd Gollan Geayee has to offer.